Effectively clean up or scoop out icing, mashed potatoes, and other whipped delicacies with this 16" spoonula! 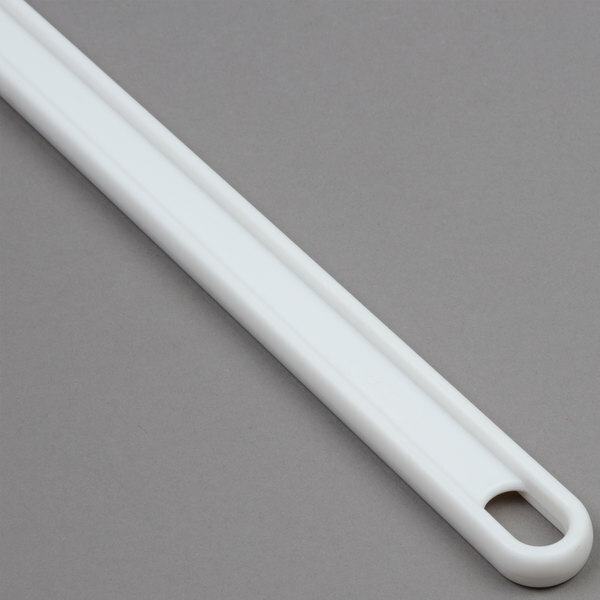 The white-colored nylon handle offers a comfortable grip for users and the slots are perfect for hanging this spoonula on hooks or racks for convenient grabbing and use. Whether you are whipping up icing or cleaning mashed potatoes out of a mixing bowl, this spoonula is sure to both scoop and scrape effectively. The white spoonula is molded together with the handle to form a sanitary seal thus eliminating smelly, bacteria ridden food traps. Additionally, this spoonula is made of non-scratching rubber. This product can expose you to chemicals including Polyvinyl chloride, which are known to the State of California to cause cancer, birth defects, or other reproductive harm. For more information, go to www.p65warnings.ca.gov. WARNING: This product can expose you to chemicals including Polyvinyl chloride, which are known to the State of California to cause cancer, birth defects, or other reproductive harm. For more information, go to www.p65warnings.ca.gov. Super long handle! Get one in every size! This can't be beat for scraping batter off the sides of the bowl, scraping the bottom of a non-stick pan, etc. Good quality. Love these!! 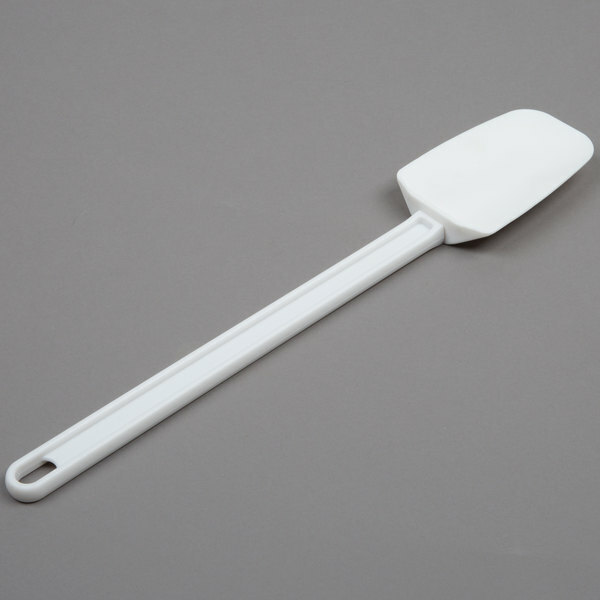 This spatula is a great size for the large commercial mixing bowls... but... it’s very stiff! It’s actually hard to scrape the sides down because it barely bends to fit the curvature of the stainless bowls. Works well. The price is good which is why we purchased them, but we use them for our buttercream which is thick and they sometimes snap. Not the best quality but you get what you pay for. Incredibly sturdy, while still having a little bit of flexibility to clean the sides of the pan. We've used these for over 2 years with caustic ingredients (soap making) and there are no signs of deterioration at all. The strong handles means we can hold on to the very end and still be able to reach the bottom of our 5 gallon pans to easily loosen stuck ingredients. It has worked great for stirring large batches, but the slightly firmer edges of the spoonula usually mean we have to call in a smaller silicon spatula to scrape the last little bits of batter out. Overall it's a great tool and I can't imagine production without it. Good quality product. Very durable and very sturdy. Excellent value for the money. We give this product a 10 out of 10. We have purchased a few different sizes, and will be purchasing more. Another wonderful product from Webstaurantstore.com. This multi-purpose tool belongs in everyone's collection. 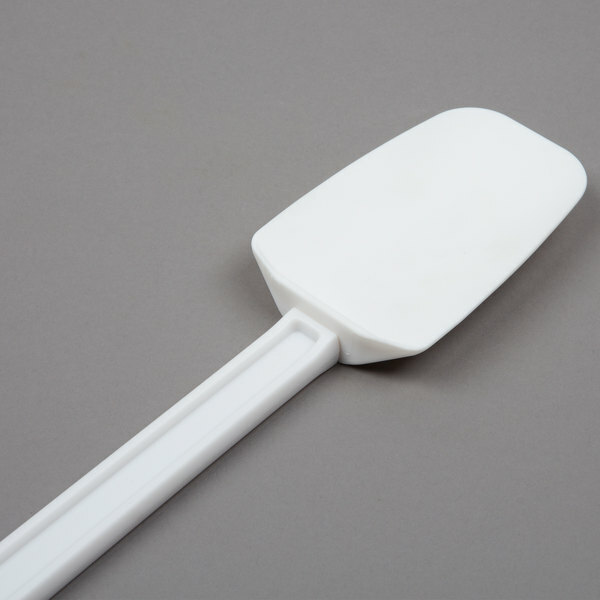 Don't stock up on conventional spatulas, these are more versatile yet more economical. I'll be stocking up on more. love how long and sturdy the arm of this product is. allows me to hold high or low depending on what I am mixing. contoured end allows better mixing of batters. also, the material is thick and does not bend while mixing! 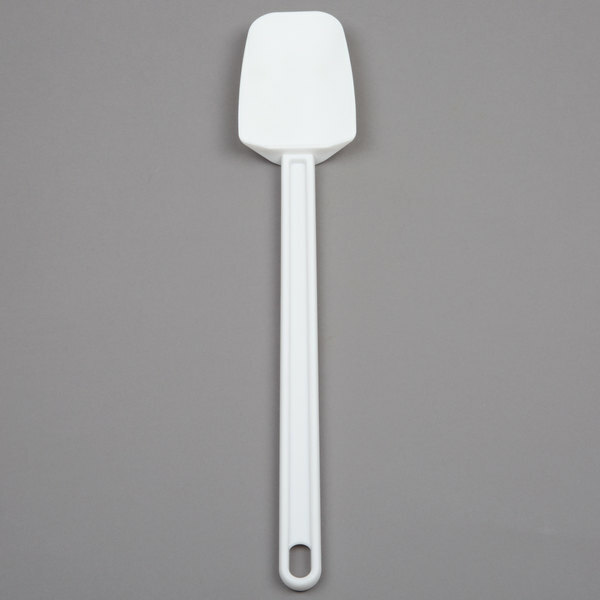 Standard white spoonula purchased for use in commercial kitchen. These will discolor over time with use, especially when using tomato based sauces. But overall holds up very well to repeated use. We love our spoonulas! These are perfect for getting all of the dips out of ramekins and into togo containers without any loss of our product! This 16.5 inch spoonula is perfect for mixing and scraping the sides of a deep mixing bowl. Solid tool with a sturdy handle. Great for thick batter or dough. Great product for mixing batters, sauces and mixes. Better than a spoon, better than a spatula. Best of both worlds. Like them so much, I bought all three sizes. Great price for these spoonulas, they are a bit stiffer than standard spatula/scrapers and work well to clean out food cans or containers with little effort. 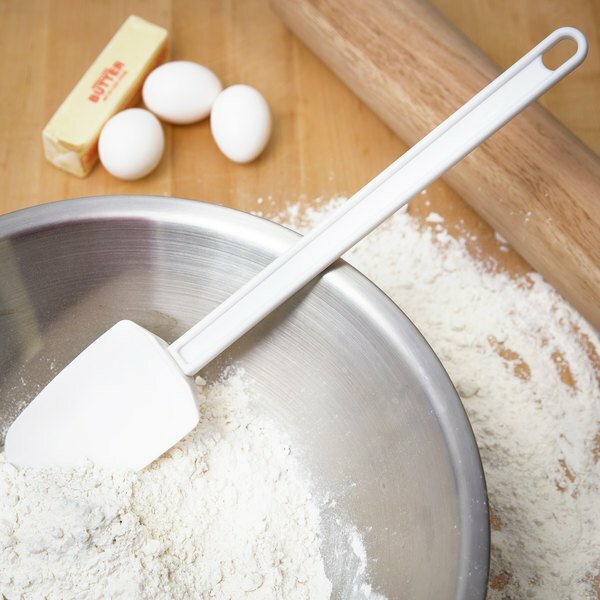 I use the sixteen and one half inch spoonula on a regular basis; especially with double batches of any recipe where there are is a significant amount of batter. This tool has been invaluable for decorating any cake or even buttering large amounts of bread. Works well, great solid construction, not too heavy and I would highly recommend. Large spoonula's are a tool pastry chefs love. Very good quality product and is priced very low. The handle features a small hole so you can hang the spoonula when not using. You will not find a lower price online or from a local store. This tool can be washed in the dishwasher and is made of highly durable nylon. When I’m dealing with large batches in deep bowls, the length of this really helps me scrape and stir. You can be sure to scrape out every drop with its design. I appreciate the Webstaurant sells such versatile products at such an affordable price. These Large spoonulas come in handy when trying to scrape out ingredients out of pots, pans, and even 5 gallon buckets- with the extra length of handle. I love being able to catch the drippings on the "spoon" part of the utensil. The utensils to tend to stain easily, and need to be bleached often to keep them white. The spoonula makes food prep very easy. We use it to scoop our homemade beer queso, or use it to stir our other items. Highly recommend. The 16 1/2" Spoonula is very long. I will never have to worry about losing this spoon in my mixing bowls. The quality is very good as well as the price. This spoonula is a great value and I definitely recommend! This spoonula is huge and it is must have in any bakery! It will help you easily work with large quantity of your product! Great price too!